Mobile, highest performance model for open-plan offices. Multi-function operating button, reversing button and integrated button lock. Auto-reverse in the event of a paper jam. Folding safety element with contact protection and integrated service flap. Automatic oiler for cutting unit (particle cut version only). Separate CD cutting unit (security level 3) and metal detection, depending on security level. 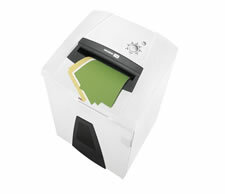 Economic energy management (EMCS).Integrated PAPERcontrol function prevents paper jams. Filling level display through inspection window. Large collection volume. With removable, reusable waste bag. Special CD waste container for correctly sorted separation of the shredded material (optional). Made in Germany.